The great thing about triathlon is that there are loads of little tweaks you can make to get a PB. 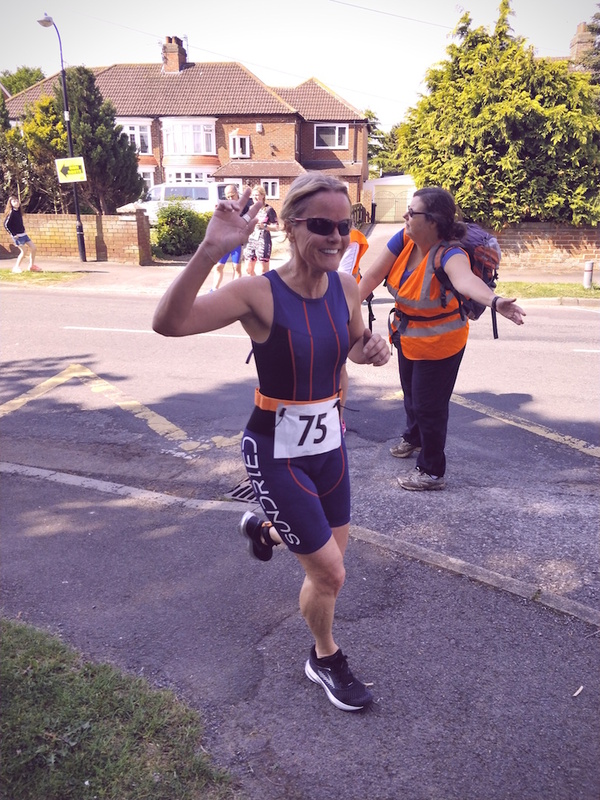 Triathlon is great fun and an exciting challenge, especially if you’re a runner (or cyclist or swimmer) who’s met all your goals. The tips below are all things that came to me before, during and after the sprint triathlon I did recently. I didn’t get a PB this time around but that was because I wasn’t paying attention to my own tips! I’m mentally putting that PB in the bag for next time though. I’ve totally got this. Please hold me to that. Triathlon is technically made up of three sports – swim, bike, run (always in that order if you’ve never done one). There are actually five components to it though – the two transitions (T1 and T2) are also important. They’re included in your time so you need to be properly prepped for them. In triathlon, your body goes from your horizontal swim to a quick sprint to T2 to hunched over your bike on your long ride then another quick sprint, this time wheeling your bike, to T2 then fully vertical to run the last leg. You’re working all your muscles – including your brain! – at different times in different ways. Triathlon isn’t just swim-bike-run, it’s the way the whole thing fits together. Get a complete picture of the race in your head, rather than seeing it as a series of different activities, and you’ll practically glide to the finish line. The bike ride is one part of triathlon where you can make massive gains. You can certainly improve your time in the swim, the run and the transitions. These will be fairly marginal gains though – you might be able to grab a few minutes back but the bike is where you can really make a difference to your time. You don’t need a fancy bike but you do need to learn how to ride it properly. Runners can be particularly rubbish on the bike, mainly because we like to thrash along as fast as we can (even if our own particular version of fast is really quite slow). As endurance athlete Susan Lacke points out in a post for No Meat Athlete, ‘most runners struggle with the bike leg because they don’t know how to shift, climb, or hold their line on a turn’. I don’t even know what ‘hold my line on a turn’ means! Work on your bike skills. Get to know how your gears work and USE THEM. Get used to speeding down hills (I don’t like that much and have to stop myself spending the whole downhill clutching the brakes). And it’s probably going to sound stupid but practice on bends, curves and corners, where it’s easy to lose precious seconds. Brick training involves moving from one discipline to another during your workout – swim to bike or bike to run. This gets your body used to moving blood quickly to the muscles you’re using in different parts of the race. Brick workouts help get your legs primed for cycling the moment you get on your bike after swimming and to avoid the dreaded jelly legs lots of triathletes experience on the shift from bike to run. There are some great brick training tips for beginners on Active and more advanced ones here on Triathlete magazine online. You’ll probably feel a bit of an idiot stopping at traffic lights soaking wet on your bike (I know I do!) but it’s definitely worth it. Thanks to brick training, I’ve finally got to the point where wibbly legs on the run are a thing of the past. These are my times from the sprint triathlon I did recently. T1 – 1 minute, not so bad. Pretty much on a par with world champions, which is pretty cool. It can be hard to remember you’re racing when in transition. You’re not actually swimming, cycling or running so it can feel like transitions don’t count. Every second spent faffing in transition counts towards your result though so make sure you save time by remembering transitions are part of the race. Triathlons are very different to running races. There’s a staggered start – whether it’s a pool swim or open water – and the pack spreads out quite quickly. This means you never know where you are in the pack. People passing you on the bike or the run – and the ones you overtake – could have started ages before you or many minutes after. You can only watch your own clock, not measure your performance against other people’s. The cycle ride can take athletes a long way from the start and finish line too so spectators can be few and far between. This can be lovely – I’ve lost time on the bike leg admiring the beautiful countryside as I cycled along – but if you usually rely on cheering crowds and banging tunes to motivate you, it could get lonely out there. Do at least some of your training workouts without music too – you need to learn to love being on your own out there. We’re by no means the world’s greatest triathletes but we do love it. I’m itching to do my next one now. I’ll let you know afterwards if I paid attention to my own tips and got a PB!